There is always room for improvement with most things, and skate shoes are no exception. Not too long after Kenny Anderson returned home to Converse – one of the best sponsor fits to date – his much anticipated pro model, the KA-One was released. The cupsole model, which shares the silhouette and toebox design with a vintage Converse soccer shoe, was a well-received surprise. 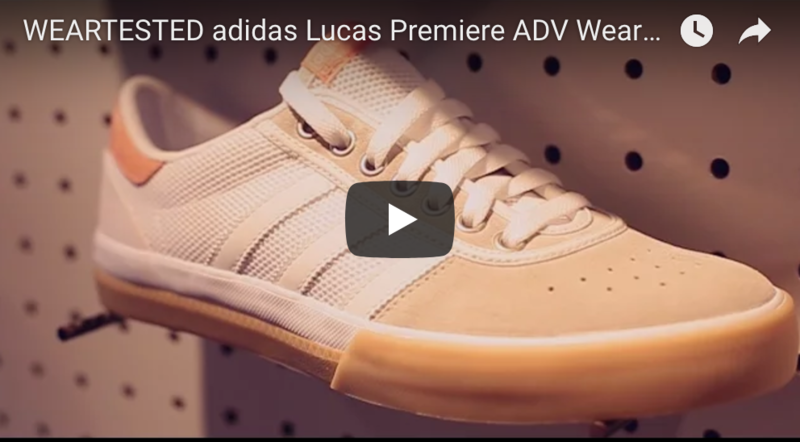 Such indoor football models, as the sport is called in Europe, seem naturally suited for skateboarding, with a few minor tweaks ­- A good example is adidas’ Busenitz Pro. However, the Cons designers and Kenny noticed the aforementioned room for improvement and didn’t settle with less. Starting with the summer 2012 releases, the KA-One features a reengineered, more flexible and grippy sole unit, as well as a one-piece toebox design, while keeping the soccer-style toe stitching. 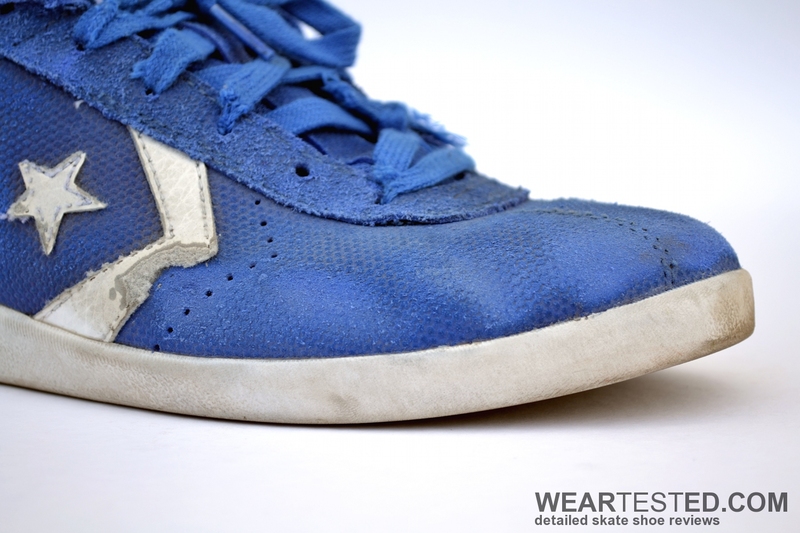 How the improved version performs on a skateboard, as well as a closer look at the accompanying vulcanized version, can be read in the following review. The KA-One fits true to size compared with other Converse models and about half a size bigger than other brands. 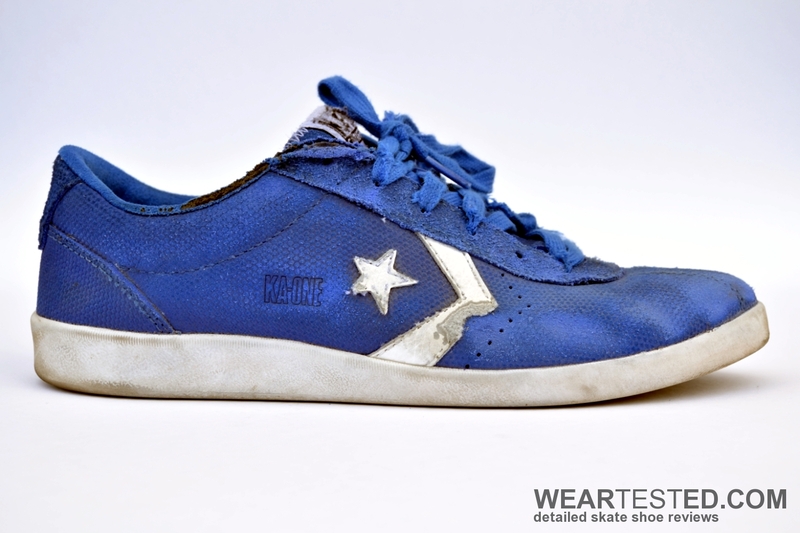 The Converse KA-One proved to be a durable model for many reasons. The new, truly one-piece toebox, which lacks the extra panel in the front and only features decorative stitching, is one of them. On one hand, it doesn’t feature an extra layer in the kickflip region anymore, which is a flaw, but on the other, it doesn’t have any components to come apart and the toe doesn’t offer any easy points of attack. The sleek and additionally sturdy upper generally doesn’t offer the griptape any areas where a tear-apart process could start. This, in combination with the new, compressed suede upper of this colorway, which seems to be less sensitive to wear, meant the abrasion after the test duration of 10 hours was minimal. At the same time, it offers a bigger surface because of its microstructure, which results in better grip and flick. Furthermore, the sole durability is great. The pattern is only of medium depth, but still, more than half of its initial depth was left after the test, even in regions with high wear. 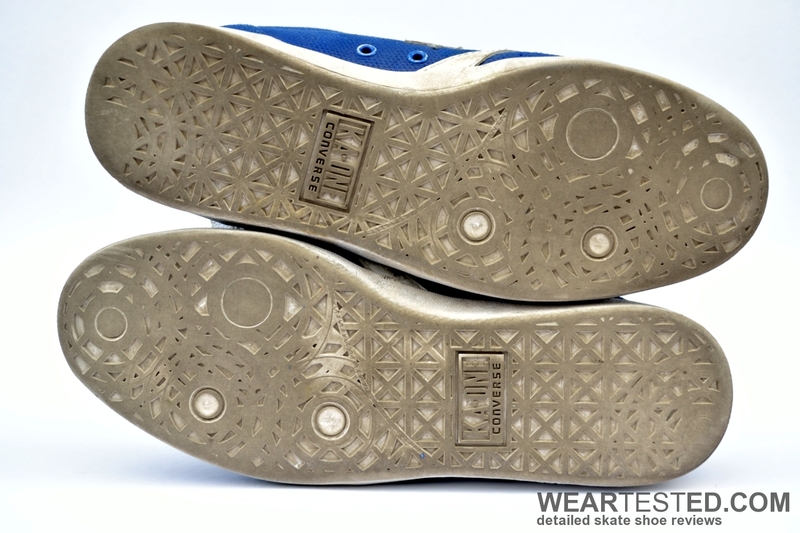 Keeping in mind that the side area of the sole is not very high, and the edges at the connection of upper and sole were still intact in many areas, the Cons KA-One sole unit handled the griptape abuse very well. The overall sole construction focuses more on great boardfeel than on dampening abilities. The thin, removable insole is only able to cushion smaller impacts and the additional thickness of the sole unit in the heel area is also limited regarding distributing and absorbing forces. Overall – although it’s a cupsole – the KA-One is more suited for low-impact skating. After all, the good boardfeel comes at a price, which is less cushioning in this case. Converse and Kenny definitely put some effort into incorporating better breathability than most other skate shoes offer. The KA1 features a part-mesh tongue and ventilation holes on both sidewalls in the area of the logo and on the toebox. Unfortunately, the perforations are only punched into the outer layer, not the inner material, which is not as effective. Additionally, there are two metal eyelets on the inside sidewall that improve the breathability further. All in all, the model allows good airflow for a skate shoe. Kenny’s cupsole pro model can’t entirely compete with vulc shoes regarding grip. Still, the soft and flexible sole causes enough friction to anchor the feet securely and fulfills today’s expectations of cupsole skate shoes. The grip benefits from the updated sole unit that adapts well to the concave, causing a maximum contact area between shoe and deck. All in all, the sole unit balances to offer both great durability and moderate grip. The soccer-inspired silhouette of the KA1 features an arrow-shaped toebox with a slightly dull peak. It offers good flick and fliptricks are easy to control. Towards the middle and heel, it noticeably widens, which seems to positively affect the stability due to a larger area to land on. Overall, it features minimal padding and fits very close to the foot. The thin insole has a positive effect on the boardfeel. The minimal amount of material between foot and deck in the front allows for good to very good boardfeel, especially for a cupsole. The increased flexibility of the sole unit contributes further to the direct contact. In conclusion, the KA1’s boardfeel can compete with most vulc soles. The KA-One is another model that proves that thin padding doesn’t have to be uncomfortable. Furthermore, the lack of tongue-centering straps, in combination with good craftsmanship and flat stitching on the inside, ensures comfort while they are worn and skated in. A disadvantage is the flat and thin removable insole. A more ergonomical shape, with a noticeable arch support, would be an improvement. The sole unit doesn’t require any wear-in time, it is ready out of the box, which is due to the flexibility of the sole. Still, some initial wear-in time is recommended. This way the feet will accustom to the rounded collar in the area of the Achilles tendon and friction will be prevented. Thin cupsole models tend to offer many advantages over vulcanized models, but often it also means reduced support, which is normally one of the strengths of classic cupsole models. This is not the case with the Converse KA-One. It features sturdy sidewalls due to the material choice of pressed suede and its construction. In addition, the plastic reinforcement in the heel helps create a supportive collar that offers a secure feeling. The medium-high cut around the ankles gives extra support to the foot . With these features, expectations of a cupsole regarding stability and support are definitely met in the case of the KA-One. At the same time as the improved cupsole version, Converse introduced a “sibling”-model with a vulcanized sole, the KA-One vulc. On first sight, both styles look very similar. A closer inspection, however, reveals that the vulcanized one is a lot slimmer overall, more arrow shaped and, especially in the toebox area, a lot narrower, which offers outstanding flick. As a result, people with wider feet should try them in person before buying and when in doubt, opt for the cupsole, which has an overall wider silhouette. Apart from that, they fit the same. The vulcanized sibling features superior boardfeel that is – typical for Converse vulc – as close to the ground as still bearable. It is easily possible to feel the threat pattern while walking. In return, a disadvantage is a further reduction of cushioning, an area where the cupsole is better equipped. Also regarding stability and support, the classic KA-One brings more to the table than the vulcanized version. A Cons-exclusive feature is a new vulcanized sole mixture, advertised as “engineered for skateboarding”. The bright light blue color is easy to spot and in fact really offers very good grip with the typical stickiness vulc soles provide. However, whether this remains the case with wear and over the total lifespan can not entirely be foreseen, but the first impression is very good. 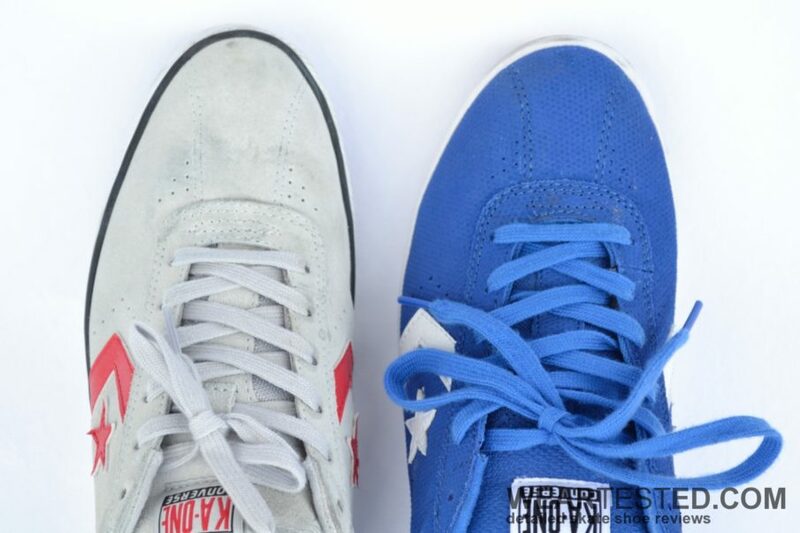 The durability of the KA-One vulc’s upper is similar to the cupsole version because of the shared upper design. The white sidepart of the sole does appear to wear out faster than the cupsole version, though, since it’s vulcanized. 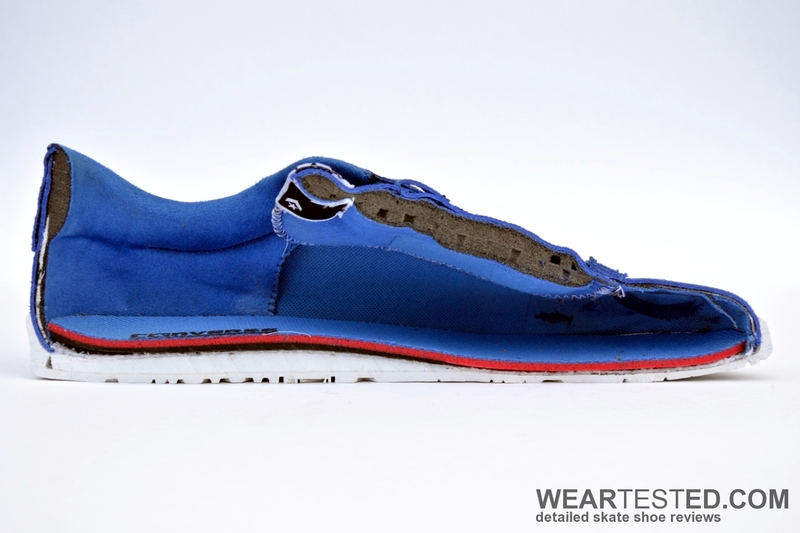 As a result, the cupsole has a slight advantage regarding durability. 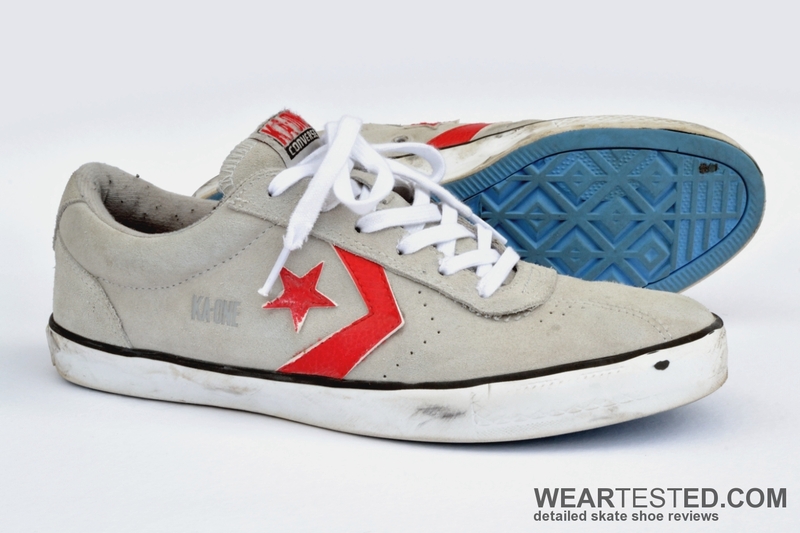 The Converse KA-One is a thin, cupsole model focusing on good boardfeel and durability. It features above average breathability, medium grip and is quite supportive. The KA-One vulc features many similarities with the cupsole version, but lacks cushioning and some stability and durability in comparison. This is compensated for, though, with very good grip and even better boardfeel. If you attach very high importance to grip and boardfeel and overall appreciate a slim and very thin skate shoe, the vulcanized KA-One is recommended. If you prefer a longer lasting, more sturdy and supportive model, go with the improved KA-One cupsole version.